Each sunrise seems to bring fresh reasons for fear. They're talking layoffs at work, slowdowns in the economy, flare-ups in the Middle East, turnovers at headquarters, downturns in the housing market, upswings in global warming. The plague of our day, terrorism, begins with the word terror. Fear, it seems, has taken up a 100-year lease on the building next door and set up shop. Oversized and rude, fear herds us into a prison of unlocked doors. Wouldn't it be great to walk out? Imagine your life, wholly untouched by angst. What if faith, not fear, was your default reaction to threats? If you could hover a fear magnet over your heart and extract every last shaving of dread, insecurity, or doubt, what would remain? Envision a day, just one day, where you could trust more and fear less. Can you imagine your life without fear? 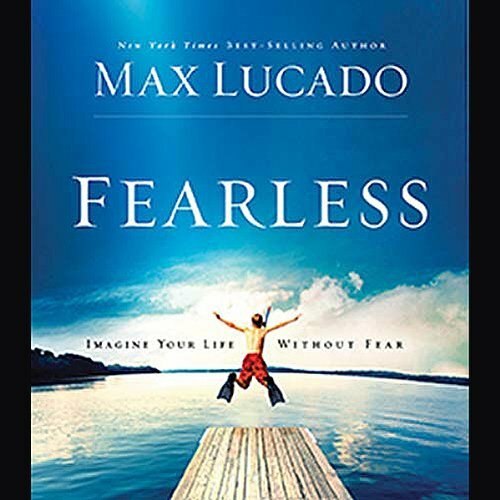 I love Max Lucado's writing and heard him give parts of this book in sermon form. So I was looking forward to the audiobook. I was very disappointed with this version. While the abridgement was good,the narrator was HORRIBLE. Hands down, it was the worst reading I've ever experience -- uninspired with no discernible cadence. I wish that I'd have spent the money on the book. First of all I loved Daniel Butler (No Offense Max) He has the perfect reading voice. Thank you. The voice would could be the greatest but without awesome material it's just another story. I have One word WOW! Max Lucado is anointed. Thank you for letting our Awesome God use you. There were a lot of holes I did not know were in my belief of being fearless, This book filled a lot of those holes (if not all) with great answers. I love how the author meshes the word of God into our daily lives. One moment he's writing about some present day life, then next thing you know he's talking about Moises and how his story fits in. Incredible. I loved this audio so much I had to get the book too and listen to it again, then fill out the small group discussion guide. (One day I'm going to take a leap of faith and do a small group on this book). I don't think that will be the last time I'll Listen to it either. Would you consider the audio edition of Fearless to be better than the print version? I have not read the print edition. What was one of the most memorable moments of Fearless? God is in control, not fear and Max backs it up with Scripture. What does Daniel Butler bring to the story that you wouldn’t experience if you just read the book? He has good emotion in his voice. What insight do you think you’ll apply from Fearless? I love Max's witty writing style. I enjoy Max Lucado but I found this to be replaying the standards..nothing fresh and new. I thought this was a good book. He liked to repeat himself a lot or tended to drag out a point for way to long. But over all the message was touching. As for the narrator he spoke way way too slow. I had to speed it up to 1.5x for it to sound like any other person in the world telling a story. Once I sped it up it was better. Max Lucado has done it again and written one of the most encouraging and comforting books I have read. I read it during a time of difficult circumstances and I listened to it several times while driving. It always calmed me and renewed my confidence in God. The content of the book was good and often comical however the narrator is HORRIBLE. I had to "gut it out" listening to him just to hear the message of the book. I really enjoyed the book, but something seems to have happened toward the end and it repeated a chapter. There was also a chapter that was interrupted by the interlude music right in the middle. I'll probably buy the actual book so I can see what I missed. Yes, the content was good. Sorry, but he had the kind of voice that might narrate Dr. Seuss books..."The Grinch" comes to mind. The narration of a Christian book just did not fit his voice. If you could sum up Fearless in three words, what would they be? Each chapter deals with a different area in our lives with examples and thoughts to help us in a faith centered way. The narrator is AWESOME! When i looked for more titles read by Daniel Butler, I was surprised I didn't find more stuff. His voice is the perfect tone to soothe and help deal with fear in a God-inspired way. By far, this book is my fave in my collection because of the subject matter as well as a great narrator. What did you learn from Fearless that you would use in your daily life? God can handle anything if we put our trust in Him. fear cant the best of me if I rely on Jesus. I loved this book it was supported by scripture and offered reassurance and instruction on how best to overcome fear just wonderful and beautifully read. there are some good examples explaining and breaking down fear. Annoyingly they often followed with something like "if you fear then give it to God". Doesn't really explain much. I like the Monopoly Board example, best part of the book.